Cebu Air Vacancy – Hello everyone welcomes to Aviation Dreamer. Are you from Philippine? and Want to become Flight Attendant or Cabin Crew? then read this article it’s for you only. Yes, friends in this article I will give you an update about Cebu Pacific Airlines Job vacancy. 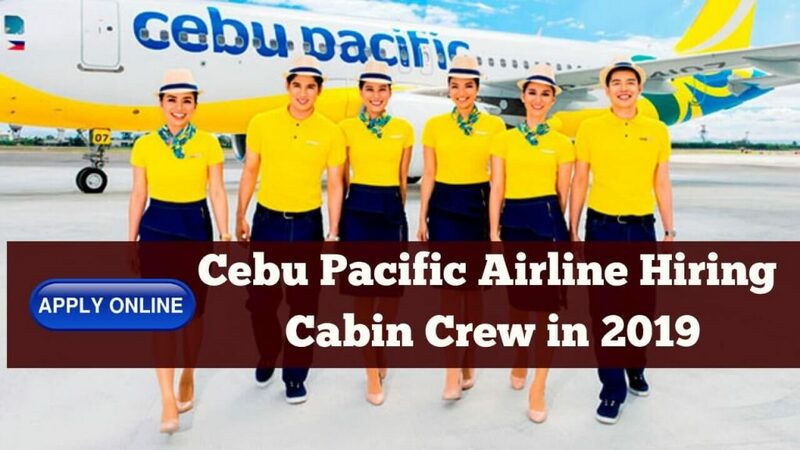 Friends my today’s topic is Cebu Air Cabin Crew Recruitment in Philippine – 2019. The Philippines’s leading airline is looking for new cabin crew members to join our growing Inflight Family. Apply our cabin crew walk-in screening every Monday-Friday from 9:00 AM to 11:00 PM. Here at the Cebu Pacific Building, along Domestic Road, Pasay City. Come in formal dress and bring 1 copy of your updated resume. Being a cabin crew in Cebu Pacific, you will fill every day is a new experience. You learn something new every day. You meet new people every day. You discover new places. You find fun and fulfillment in what you do. Be the JUAN to make a difference in our guests’ #CEBTravels experience. Be the face of Cebu Pacific. For females, there is a minimum height of 5’3 and 5’7 for men. You should have reached the college level. Language Proficient in the Filipino and English for both reading and writing. Metro Manila wants to be handed out. To apply Cebu Air as cabin crew you have to Click Here and it will redirect you to Airlines official website. Then just you have to click on apply online and fill the form correctly and submit it. you will be done. Thank You. Do airlines need Hospitality Experience For Cabin Crew Jobs? What are the airlines looking from the candidate? If you have any query related to Aviation Jobs and Interview you can comment on the below And also you can contact me on my Facebook Page and YouTube Channel.